Meet the #RunPainFree Ambassadors making a difference in the running community! You've tried PT (Physical Therapy). You currently have a Running Coach. You have a chiropractor...And you're still running in pain. 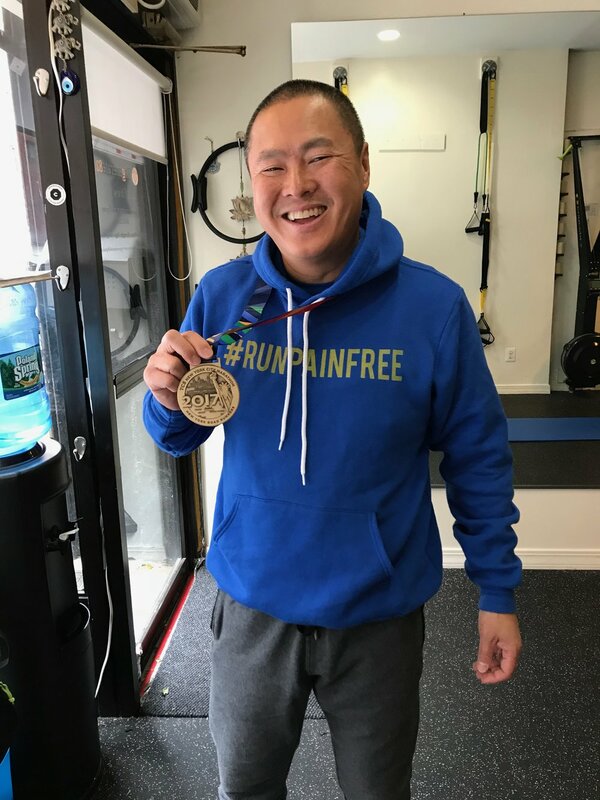 The runners who come to #RunPainFree have been to Physical Therapy, Chiropractors and Doctors and still have not had any relief of pain. When the Doctor says it's time for a lifelong prescription to pain drugs or another trip under the knife, one consultation is all we need to know whether we would be able to get you to #RunPainFree. The first #RunPainFree Ambassador, Ana Rodriguez NYC. From severe list, to lead runner, coming in 1st of the #RunPainFree class of 2016 and 2017 NYC Marathon. She has Boston Qualified for 2019 and has gone on to learn the curriculum, help and coach her peers to #runpainfree! From one of the most severely injured runners, #runpainfree class of 2016, to lead male runner, class of 2017! From not running, to racing over 50 races in 2017 hitting the 6 min mile pace! Ahead of the game, an Occupational Therapist, she came for prevention of injuries. She ran her first Marathon at the NYC Marathon apart of our class of 2016! She's an example to everyone on how to, run healthy! Dawn started her correction and 2 weeks later had a stress fracture on the Lebow half. She stayed IN correction in her boot, was out of her boot in 4 weeks and ran a half 2 weeks later, and Paris Marathon 2.5 weeks after that. Her pain became her teacher, and she is now a go to amongst her friends for help! Tri-athlete, Kelly has been an avid #RunPainFree supporter, even before her correction. This is why she knew where to come at the first site of pain in her calf, and then her shoulder. Her tenacity is what makes a #RunPainFree runner, She's headed for an Ironman now! PPTC member, Jimmy, came to us in 2017, not AFTER months of his teammates telling him to see us, but after his calves had enough! He ran 3 marathons in 6 weeks; Berlin, Chicago and NYC in 2017.. PR'ing in the 3rd FYI! Jessica broke her stick over his calf.. he holds this very dear to his heart. Army Veteran, Captain of #JustKeepRunning a national running group on FB and IG, came to us for her leg cramping, but of course we found injuries causing the cramping. She's ran half and full marathons up and down the coast, and over seas...stopping at nothing to get her best potential and uplifting her team as she does it! Yvette's "no-nonsense" approach, is exactly why she is an Ambassador, a role model for all of us. Nancy of Long Island, commutes hours to get to #RunPainFree, and she brings everyone in pain with her, in spirit! She takes all her lessons and immediately shares them with her team, peers, and family. She is a national and internationally decorated Marathoner, and a HUGE Run-Disney runner! Her consistent, dedication to herself is motivating and inspiring, and thats why she is an Ambassador! Philippa of Harlem Run, set out to challenge her body, and superseded her expectations. She redeemed herself in 2017 and set a plan to create the body she wanted to be able to achieve a whole new set of life goals. Along the way she has helped countless runners, with her own working knowledge and progress. She has been diligent in her training, to achieve goals, that then leads to more goals… a true #RunPainFree runner. She’s an example of making sure you go after what YOU for for YOURSELF, no matter what. This is why she is an Ambassador. Jessica's apprentice, our youngest runner who will beat anyone she runs with! Her love for running came out of supporting her older sister when she was sick, and Phylicia fell in love with what came natural to her. While in correction for her hips and stability to support her talent, she now watches others move, learning bio-mechanics and movement patterns.. she will be a force to be reckoned with when she is 18! She's also a New York Road Runner child ambassador, Freshman Track & Field Captain, serving as a role model already to not only kids her age, but adults as well. We Get Rid of your Running Pain. People frequently ask me about what services I offer, Am I like a PT or personal trainer, Is it closer to what a chiropractor does? On and on.. Here I take the time to clarify. Jessica, Isn't all PAIN bad Pain? No. And I explain how this applies to you as a runner, looking to set a new PR, and run longer distances with less discomfort or pain. Here I explain the "Every one has their own philosophy", quote I get a lot. Your body will follow what your subconscious thoughts say. If you truly commit to the process, you will see the results. Jessica...Once you get rid of my knee pain...Will it come back? I answer this while explaining the differences between going to rehab and actually correcting the root cause of your pain. Jessica, Are you a Personal Trainer? I'm a functional movement expert. Personal Training in New York City was just a stepping stone to what I do today. I explain the finer details in this Bonus misconception video. Have a Specific Question for a #RunPainFree Specialist? Click Here!